When Florette arrived at my house, I slipped the book from its packaging and placed it gently on the kitchen bench. I read it immediately. No way, Anna. No way. When I read Mr Huff last year, I believed nothing could be better. I didn't think Anna could outdo herself. Strangely, I don't think Mr Huff has been at all superseded here, because each book stands alone, especially Anna's books. But Florette--well... it left me with the same overwhelming 'nothing could be better' feeling. And also a feeling of 'how did she DO this??'. That's how intuitive, flowing and ethereal the words and pictures are. And that's what Florette is. 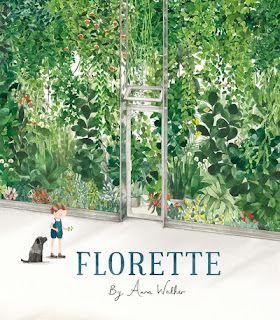 A masterfully-connected set of words and pictures that pin Anna Walker, in my humble opinion, as one of our greatest storytellers for children. Mae and her family are moving to the city, leaving behind their beloved garden. There is no room for apple trees and daffodils among the crowded rooftops of her new home. And Mae misses her friends, and the birds and gathering treasures for her jar. So the little girl sets out to create a new kind of garden on the grey streets of the city and in the new places and spaces she encounters. And one day, she encounters the greatest inspiration of all--Florette. An enchanting glassed-in forest in the middle of the city. This forest inadvertently gives Mae a gift that transforms her new world--and the world of those around her. A beautifully-penned narrative with truly exquisite illustrations--this is the type of book you really need to see for yourself. I have endlessly pored over every wash of watercolour in this book, intrigued and awed by the detail and beauty. And I've so wanted to pluck Mae from its pages, in her navy blue romper, and hug her close. What a delightful, inspiring child--who is sure to inspire so many readers. Mae is the kind of child who inspires others to change the world. I treasure this book. I treasure how it made me feel. I treasure the subtle detail and seamless waltz between Monsieur Word and Madame Picture, that create a kind of Third Entity that transcends both word and picture. I guess it's 'emotion'? I don't know. But it's a beautiful thing. It's mid-November 2016 as I wrote this review. The only thing I'm sorry about is that you, dear reader, will not get to meet Florette until today. Enjoy her every bit as much as I have.